-Free Shipping on orders above $250. Hurry up!!! what can i say 😃 i am speechless, these two Cholis are an amazing artwork! I highly recommend this shop, very happy with my purchasing. It's even more beautiful then on the picture. The contact with Shahin was just fabulous, she made it a treat. Working with shahin was a breeze. 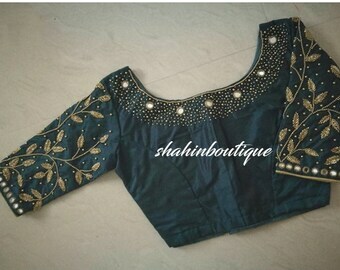 She did a fantastic job gathering all the minute details regarding the blouse design. 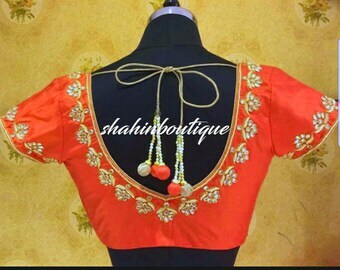 I have got blouses from other vendors and I could clearly see a great difference in quality and workmanship. I would totally recommend her! Her prices are very reasonable too for the work on the blouses. Will definitely come back again! 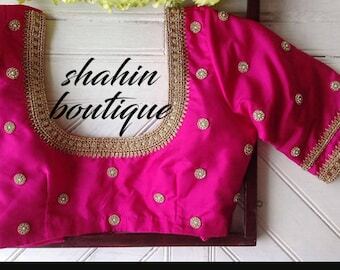 Shahinboutique is a leading brand in Maggam works based in Secunderabad. I, Shahin along with 10 other designers have an experience of working together for more than a decade. We have seen our business flourish in the last few years. The whole team strives hard to meet the customer's needs. We sell handmade items made exclusively at our store.From buying the raw material to stitching and knitting,designing,we take care of each and every step. We are now looking forward for an amazing experience with every individual who visits our store in Etsy. 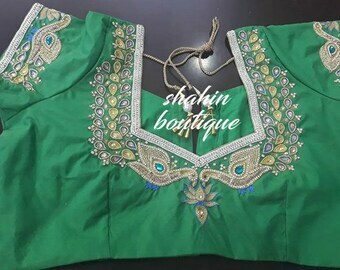 Can I customize my blouse for various colors and designs apart from the listings? Do you design blouses faster and provide faster shipping options if it is urgent? Yes, we do take up Express Shipping options (2-3 days after we design the blouse) for faster delivery of items. Please let us know by what time you are expecting your product to be delivered and select Express Shipping in Checkout. 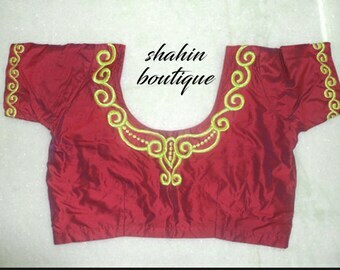 We will definitely design the blouses and send to you by the date you expected. Do we get blouses according to sizes and measurements we provide? Can I get a refund if I did not like a product after its been made or shipped? A customer is expected to understand that each and every design is made according to his or her choice and size, so,once a payment is made, refund will not be given at any cost as we do not accept product returns,exchanges or cancellations. However, for any transaction related issues or when the product has not yet been stitched or designed, a refund may be considered and processed based on our team's approval. Are discounts and offers applicable on every item? Right now the special offers and discounts are available only on blouses. Cannot use offers on anarkalis,churidars,lehenga cholis,etc. Is the design present only on the front right side of the blouse by default? Yes. 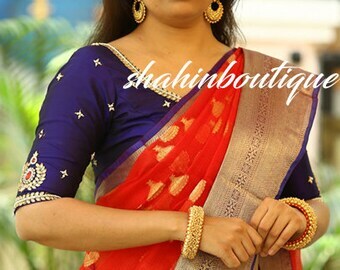 By default, every blouse has design only on back,both sleeves and design on front right side, leaving left side empty. 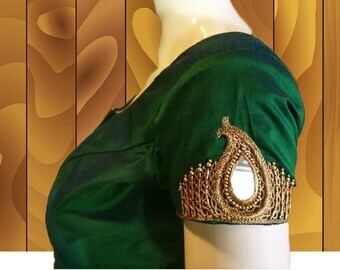 This is to avoid damage to the saree due to heavy designs, if palla is worn on left side. The customers can ask for 2 sided or allover design and will be charged extra, as artisans have to design everything inch by inch. Please note that we are NOT responsible for designs made only on one side if the customers have not mentioned it and secondly we are also NOT responsible for any damage to saree due to heavy work of blouse. Can I get a refund if my package is lost or damaged after shipping by the courier services? We are NOT responsible for package that is lost by a courier service. As a seller, our responsibility lies until we handover the package to the courier. Once the package steps out of our store, we are NOT responsible for any damage caused to the product later on,as well.So any buyer asking for a refund due to this reason,will not be entertained. Custom sizes are sizes lower than 32 inches.For sizes greater than 46 inches,please contact us.We make all plus sizes. What material do you use for making the blouses? 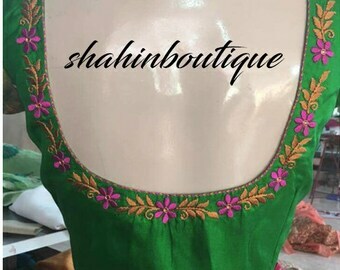 We actually use more of cotton silk and raw silk by default(depending on availabilty of colors in either of the varieties)with 100% Quality assurance from our end.The fabrics used for making blouses are very soft and can always be used in the long run. Will the price change if design is changed or neck pattern is changed and is different from the picture? Yes ofcourse.As we need to design extra we may charge you higher. Also we charge more as we have to buy more fabric for taller or plus size persons compared to default.